Meet Saghan. A venomous viper, hailing from the distant swamps of Drakora. 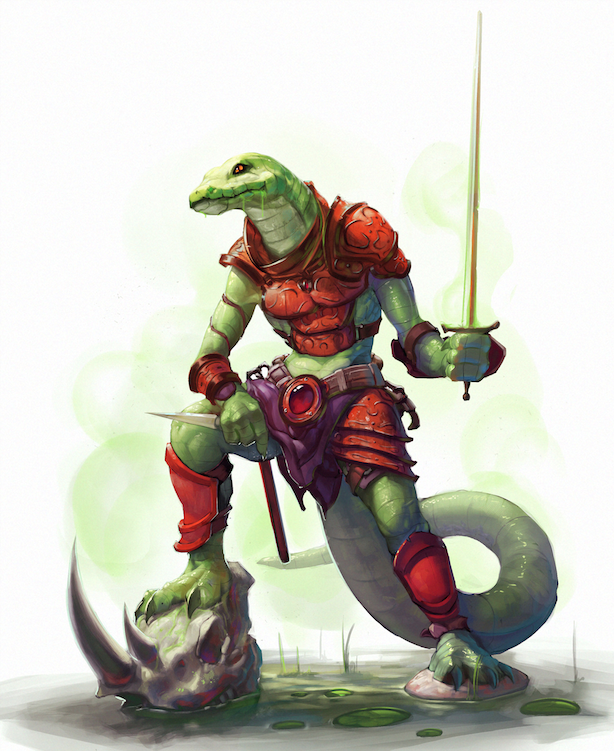 A slithering, green-scaled assassin with little care for life - whether those of his victims, or his own. A slave. A self-aware puppet who knows he can never break the invisible strings of the all-powerful puppeteer. I commissioned this concept of Saghan about a month ago, and while I received a couple other pieces in the meantime (including this amazing one of Maxan, if you haven’t already seen it), I am so utterly impressed by artist Nic Morales’ interpretation of my character that I’ve sent him to the front of the line. Saghan serves as a foil to Maxan. Whereas Maxan makes choices informed by his sense of right, Saghan has no choice, and has given up on the idea of deciding his own destiny. And yet, we have a fox, and we have a snake... Both creatures known for their cunning, their guile, their deceptive natures. Maxan and Saghan are more alike than they know. This right here… This portrait… THIS is EXACTLY what I saw in The Animal in Man. Make no mistake, this world is brutal, full of beasts, full of killers. I truly wish I had more news in terms of the book’s publication date, but no movement has been spied on that horizon just yet. Please continue to be patient, as I am. And in the meantime, I will continue to post new pieces of concept art as they come in. Thanks as always for your continued support, my dear Animals.